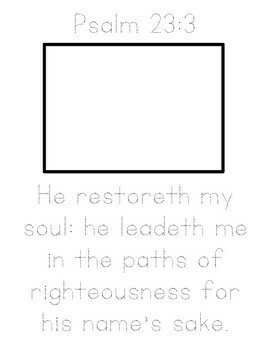 I printed the second page of our Psalm 23 Bible Verse Tracer for the boys to work on this week. This week we read about Jesus’ death and resurrection. Afterwards, the kids made angel sun catchers. We taped them to the playroom window, but we haven’t had much sunlight lately. We worked on our Advent lessons over Christmas break and will continue to add any remaining items to our “WINTER wreath” during January! It’s like the scent of Christmas lingering in the home. 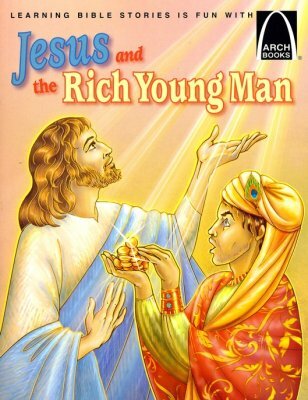 We read Jesus and the Rich Young Man and talked about how the young man wasn’t willing to give up his riches. We talked about the beauty of generosity. I gave the kids some M&Ms and asked them to divide them equally. Haley added candy to our wreath that day! We started our forgiveness lesson by making soft pretzels. Jordan is my go-to chef. He gathered the ingredients. He measured and added them in the bread maker, and we set it on the “dough” cycle. Later that evening, we read the Bible story about the two debtors. We talked about having a “soft” heart, like our soft pretzels, and forgiving others like Jesus forgave us. Jordan added a pretzel to our wreath. We continued lapbooking around the world with Kate and Mack. This week we were learning about Russia. Everyone was a bit bummed Christmas was over. I brought a little Christmas cheer to the table in the morning! December 7th is the day children in Russia celebrate Christmas! Everyone had little goody bags to open! The kids created their snowflakes while I read the story aloud. This was a wonderful way to add a dash of fun on our first day back from Christmas break. Later the boys colored their Russian flags and sketched elements from this weeks reading. 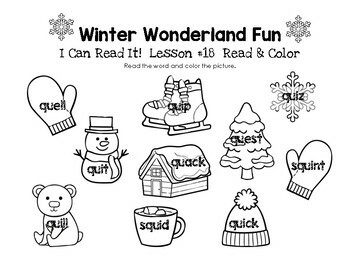 I created a Read, and Color worksheet for our I Can Read It Lesson #18. Parker used many dot paint colors for this week’s Christmas themed worksheet! This week Parker was learning about using apostrophes used in contractions. I printed a copy of our Hot Cocoa Contractions pack. First, Parker matched the marshmallow words with the hot cocoa contractions. 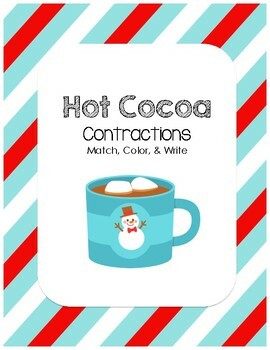 Later in the week, Parker completed another Hot Cocoa Contractions worksheet. This week I made a Wanna Build a Snowman? 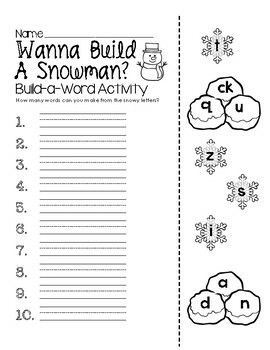 Build-a-Word worksheet for Parker. 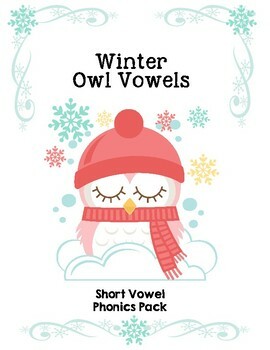 I created a Winter Owl Vowels pack for Parker to work on matching the middle vowel sounds. You can purchase it here at our TPT Store. There’s a bonus FREEbie in the Preview! Next, I laid out our Owl Vowel cards and gave him the stack of CVC snowflake picture cards. He said each word and sorted them by the middle vowel sound. I created a January Calendar page for the boys to work on. First, they numbered their 2019 January calendar. Then they answered a series of January-related questions. This week we started our new science book about the human body. Just for fun, we brought out our human bodies we made during our FIAR Madeline Row last year. They practiced using their “brain” to control the digestion process as well as telling their lungs to breath :). We brought out our tub of Crazy Aaron’s Thinking Putty after school for some sensory play. I opened up our Usborne Human Body book as a reference and we all made little cells. It’s fun to sit around the table, chat and play. I seem to always be on the go, cleaning and picking up after school, but it’s fun to slow down and enjoy these moments while we can. Everyone joined in on this activity and even asked to bring them out the next day too! Hot Cocoa wasn’t REALLY part of our Sonlight curriculum this week, but I wanted to incorporate it as a fun science activity that Parker could use for his creative writing assignment this week. This is a fun chemical reaction that your kids may not suspect as being a science experiment and can be a cute and festive “prank” to pull ;). I layered the bottom of a mug with baking soda then added a layer of hot cocoa over the top. I used a flavor no one liked, so not to “waste” any precious hot chocolate! I served it on a plate with a spoon and a dispenser of hot water (laced with citric acid instead of vinegar, so no one would suspect anything). “Um, that’s weird.” was about the response he got when he saw his mug erupting with cocoa bubbles. Then he started giggling and laughing as he added more “water” and it REALLY erupted! And again with his big sister, who knew it was coming, but still played along. He typed it up all by himself and we reviewed it together. He really took his time writing an introduction then putting down each step of the process. Great job Parks! Looking forward to more fun next week!